The conversation at the radio club got onto the subject of magnetic loops. It seems they are seen as a bit of a poor choice. I’ve considered building a loop, but have been worried about the capacitor needed and the potentially large voltages that can develop across it. It would be hard or expensive to find a good variable capacitor, and I’d not want to leave one of these things unattended in the attic. The problem stated with magnetic loops is their efficiency. They need little resistive loss in order to work well. There are numerous portable loop projects online using coaxial cable and small trimmer capacitors. Apparently people use these well with low powered radios such as the Yaesu 817. There is still the question that if the loop can be made to work well there must be a large voltage across the capacitor, and a large loop current. 66pacific.com have a magnetic loop calculator. It’s easy to put the information into a web site, but the web site does seem to use formulas that take quite a lot of fiddly stuff into account. According the site, if I make a 5 metre loop using 22mm copper pipe then I should be able to make an antenna that works well on the 20m, 30m and 40m bands. The capacitance will need to vary from 111pF to 32pF, and if the loop works well and my solder joints are really good it will need to withstand 1500V RMS for use with a 10W radio. There could be quite huge tolerances here because I’m not going to be able to make anything that accurately. It won’t be very portable, but it could work. This diagram represents a possible trombone capacitor for use at the top of a magnetic loop. The red lines represent 15mm pipe. 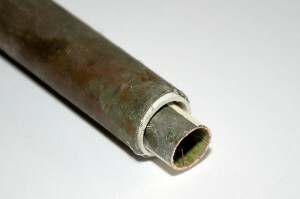 The black lines represent 22mm pipe. There are four capacitors here – two parallel pairs in series with each other. This can give me a reasonable capacitance in a short length. A mechanism is needed to slide the trombone in and out. There seems a compromise here. If I make the tubes too long then I expect I’ll be changing the loop quite a bit. There will be added inductance. If I make them short by doubling up then the antenna may become harder to tune. I’d wondered about using a motor system with a microcontroller that can replay positions according to desired frequency, but if the movements are too small then it could be very hard to achieve, and could be ruined by temperature changes. An alternative arrangement could be to place a pair at opposite sides of the loop. Then the loop can be taken apart for transport. It could become harder to adjust because of the size of the moving half loop. If not for that low 32pF needed at 14MHz there is some merit in examining the idea of distributing the capacitors around the loop to ease dismantling. What would it do for efficiency? This experimental trombone was made using 22mm copper pipe on the outside, 15mm pipe on the inside and 20mm plastic conduit as the dielectric. The conduit fits tightly into the outer pipe and will hopefully block the high voltage. The 15mm pipe fits loosely inside. The overlap is about 40cm. If I built this into the 5 metre loop then it would come between 1/3 and 2/3 of the way into the loop. It’s perhaps too big. The multimeter shows a reading of 178pF. It can be quite hard to find the dielectric properties of the plastic pipe, and I wondered how it may behave at radio frequencies. It may change permittivity, and it may be lossy. I connected my Mini-VNA network analyser through a spare piece of cable to the crocodile clips and calibrated it. It’s perhaps not ideal and subject to very large errors! I don’t have a capacitance bridge to play with. My test leads were long which may have transformed the impedance depending on frequency. I swept the Mini-VNA over the frequency range of interest and took measurements at 8MHz and 14MHz with the pipes fully overlapping and partially overlapping. The impedance dropped with increasing frequency as expected. The capacitance was calculated only using the Xs reading and the Rs reading ignored. It would appear that capacitance is increasing with frequency, but this may be due to other error in the measurement. I checked calibration by shorting the crocodile clips, leaving them open and applying a load made up of two 100 ohm resistors in parallel. So obviously my accuracy could be improved. All I can deduce is that capacitance does seem to go up as the overlap between the pipes increases. The test would be to try it in a loop. This entry was posted in Antennas. Bookmark the permalink. A couple of links with some warnings about trombone caps. Basically, the added series inductance and path length reduces Q and increases losses. I think (but have no data to back it up) that your idea about using two paralleled and shorter capacitor sections is better than one long section. I’d be interested in knowing how well your capacitor ends up working. Be aware that the added series inductance can also cause a reduction in the antenna bandwidth (because not only the capacitance but also the inductive reactance of the trombone capacitor is changing as you adjust the trombone capacitor) which makes it dangerous to assume that narrow bandwidth equates with high efficiency. Thanks for the info. I’ve had to put the project to the side a bit now I have 3 kids (twins just arrived). I wonder what the inductance would do. My initial thought is that it would add to the inductance of the loop, but it is in parallel with the capacitance at that point so maybe there will be some other effects and interactions. It could be an interesting one to model and reminds me in principal of the mechanical vibration dampers used on some structures such as footbridges. They are little resonators attached to the main resonant structure (the bridge) which interact with it so taking out the resonant peaks. Xc is expected to change with frequency. Are you indicating that the evaluated C is changing _more_ than what’s expected from a given ractance measurement? If so, that might indicate that the dielectric used isn’t terribly stable at RF frequencies or you’re nearing its breakdown voltage. Thanks for the question. I’ll have to revisit the article and check back on what I did. It could be problem of cheap dialectric. This was plastic piping not usually sold for the purpose. It could be error in measurement or technique. If I was using the Mini-VNA then its fly-leads would be significant. I made a trombone capacitor out of an an aluminum pipe and a redbull can. The gap between the two is 5.2mm. I use the syringe drive to adjust it in my loop. The fist thing I noticed was that it was not as sharp as a butterfly cap I have although the capacitance was roughly the same (Around 200pF) but it is a power player! My radio puts out 150W and the capacitor is just fine. I checked into an afternoon net on 20M (CAP), which I can barely do with my 65 foot folded dipole. The reception was very clean (because of the narrow bandwidth) and they did copy my despite the fact the loop was at 3.5 feet from the floor and between two concrete houses SWR 1:1 @150w. Not bad! Keep it up! That sounds good! I can imagine the benefit of the narrow bandwidth. One issue we’ve had covering general safety radio at events is interference from other services using radio. We used a repeater with output in the UK General region on a recent Three Peaks event, so there was difficulty receiving for some stations due to de-sensing with the event organisers and St John Ambulance transmitting nearby. The use of a repeater with input on the amateur frequencies and output further up the band required lower gain less selective antennas. (We provided comms into the mountains so needed more range than the short range VHF handies used by the ground crews). A station using a more selective antenna such as my 5 element beam tuned to the amateur safety radio part of the 2m band would have worked a lot better, both by rejecting the UK General frequencies and being able to locate it such that the other transmitters were in a null. If I’ve not done so, I’ll have to write up a report on my beam including its SWR plots. It’s surprisingly selective, but that’s quite useful for simplex work.